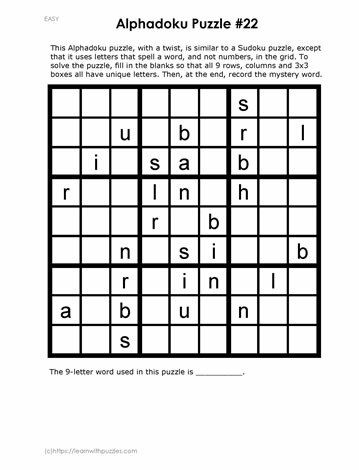 This Alphadoku puzzle uses the same principles as your basic Sudoku puzzle but uses letters rather than numbers. Experience with Sudoku puzzles helps solve these brain teasers. Solve this brain teaser using basic Sudoku rules. When the puzzle is completed record the unique nine letter word at the bottom of the page.